These potatoes are golden brown on the outside and creamy on the inside and just melt in your mouth. They have a wonderful, deep flavor from the chicken broth that just adds to their richness. Of course, you can make these vegetarian by using vegetable broth instead but, however you make them, your guests will clamor for more. Combine melted butter, rosemary, salt, and pepper in a medium bowl. Cut potatoes into 1-inch thick rounds. 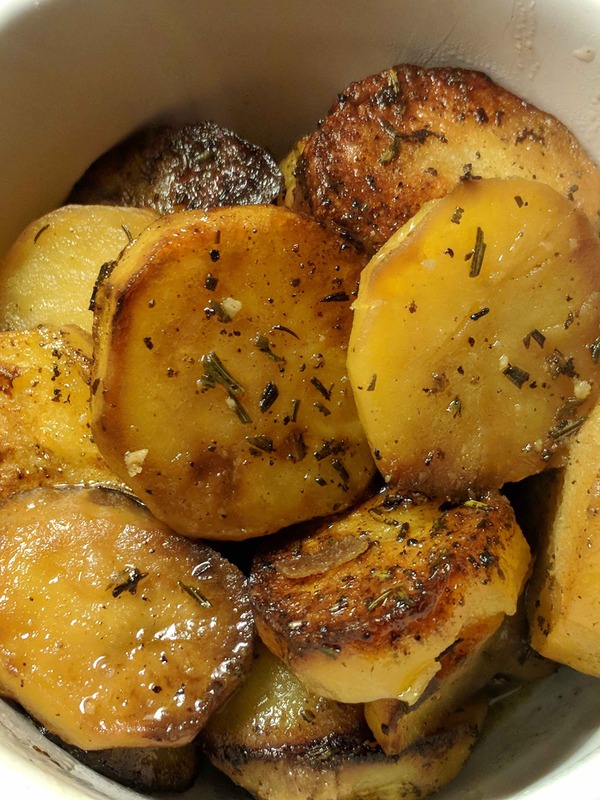 Toss sliced potato in butter mixture and then arrange in a single layer in a 9 X 13-inch metal baking pan (use a metal pan as glass baking dish can shatter in such a hot oven) and roast for 15 minutes. Remove pan from oven and use a spatula to flip potatoes over. Place back in oven for 15 minutes. Remove pan from oven. Stir garlic into chicken broth and then pour over the potatoes. Flip potatoes one final time. Place the pan back in oven and cook until potatoes are tender, about another 15 minutes. Baste potatoes with sauce and serve. My friend, Victoria, says this cake is the love of her life. 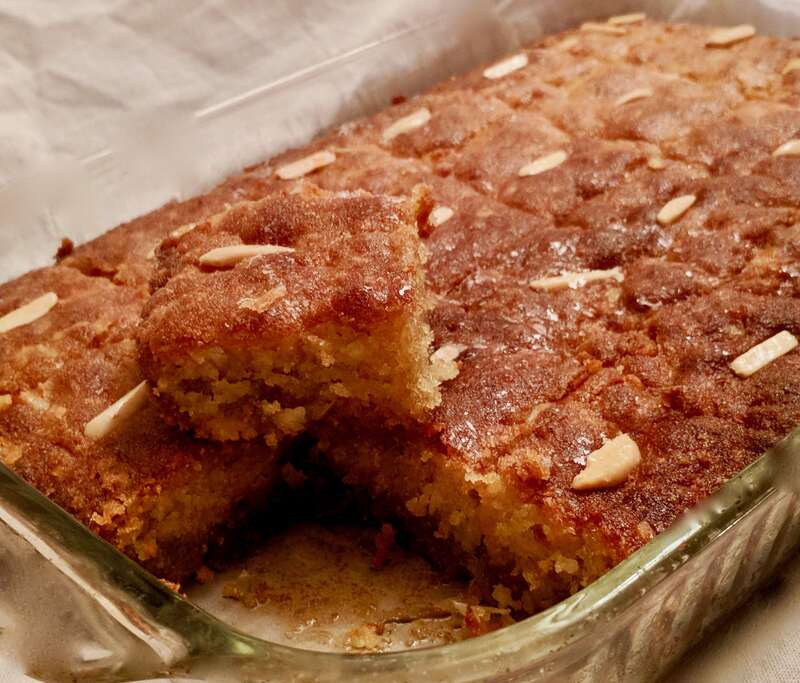 It is an Arab Semolina Cake, sometimes spelled harissa or harisa or haresa. I was happy to make it as part of her family cookbook project. Trust the instruction that has you mixing with your hands – it is the easiest way to incorporate everything, so embrace your inner child and get your hands busy! It definitely helps to measure out all the ingredients first, so you don’t make too big a mess. And press it down well – it won’t hold together unless you make sure you compress it to 1 inch thick (again, best results from using your hands). Mix yogurt and baking soda in a bowl and wait until yogurt doubles in size. In a large bowl, mix all other cake ingredients together with wet hands. When the yogurt has almost doubled in size, pour it on top of the semolina mix and use your hands to mix well. When the mixture is well combined, press it tightly into a buttered 9×13 pyrex baking dish. The unbaked cake shouldn’t be more than 1 inch thick, so press it well. Cut diamond or square designs with a butter knife and place an almond on top of each piece. Bake for 30 to 40 minutes, until dark brown. Mix sugar and water together in a saucepan, bring to a boil, stirring regularly. Reduce the heat, and simmer for 20 minutes, or until it coats the back of a spoon. Add orange blossom water and stir well. Pour boiling syrup on a very hot cake. Here is another recipe to help use up any leftover cranberry sauce after your Thanksgiving feasting. My other version is here. 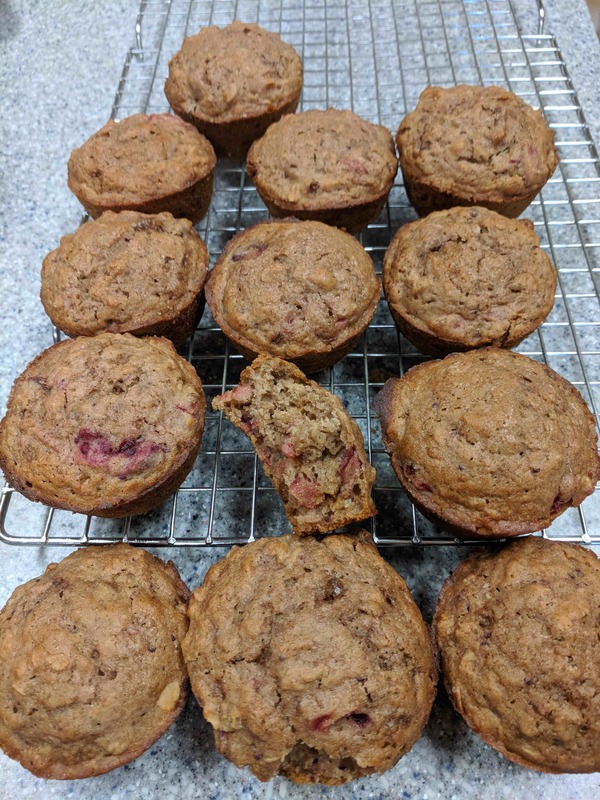 I primarily did these because mom had less flour than I anticipated (and Dad was still expected me to make a batch of oatmeal cookies) because they include oats in them. Preheat oven to 400°F. Line muffin tin with paper baking cups or butter the muffin tin. In a large bowl, combine regular flour, oats, brown sugar, cinnamon, baking powder, baking soda and salt; mix well. In medium bowl, combine milk, oil, cranberry sauce and egg; blend well. Fold wet ingredients into dry. Stir just until dry ingredients are moistened. Fill muffin cups about three-quarters full. If desired, sprinkle the tops with cinnamon sugar. Bake 20 to 22 minutes or until golden brown. 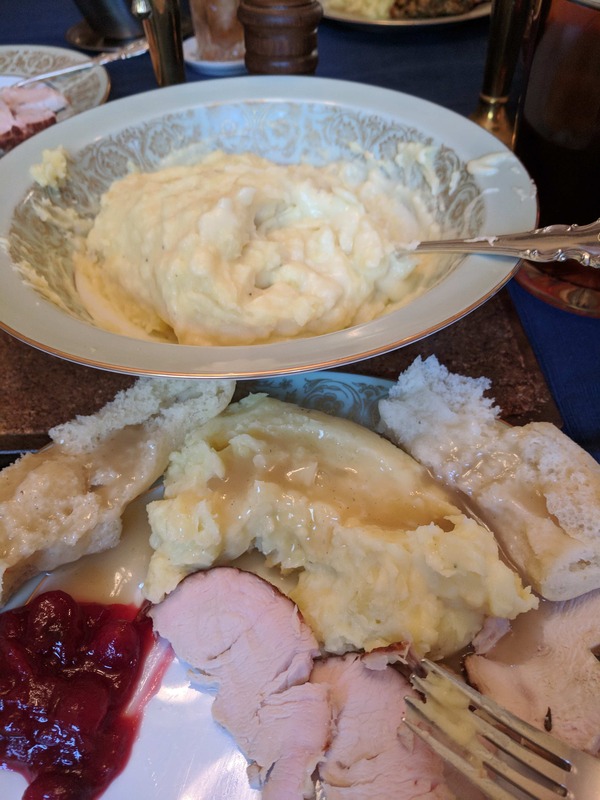 I like Yukon Gold potatoes for making mashed potatoes, since they are much harder to over-mash (due to their lower starch content) and because of how fluffy they naturally are. Typically, using them means I don’t need to add as much butter. The operative word in that sentence is need. If you find yourself at looking to indulge your taste buds and give the finger to your cholesterol level, look no further than this recipe for mashed potatoes. I make these with whole milk and lots and lots of butter. The result is a smooth, mashed potato that is very rich and decadent. The only thing missing might be a little cheese. However, because we were serving these at Thanksgiving and wanted to cover them in gravy, we skipped that step. Rinse peeled and cut potatoes until water runs clear. Let drain. Heat butter, milk and 1 teaspoon salt in a large saucepan. Once butter has melted, add in the potatoes. Bring to a boil. Reduce heat and simmer until potatoes are fork tender, about 30 minutes. Stir regularly. Drain potatoes over a large bowl, reserving the liquid. Return the liquid back to saucepan and turn heat to low. Mash potatoes by hand or use a potato ricer or food mill. Add cooking liquid to potatoes until a little looser than desired consistency. If not serving immediately, add even a little extra to keep things from thickening up too much. Season with salt and pepper. I confess that I’m not much of a turkey fan, except in sandwiches. For that reason, I don’t cook a whole bird for Thanksgiving but rather get just the breast – either bone in or boneless. I also grill it, so that the oven is free for all the treats and trimmings that go with the meal. About an hour before you’re ready to start cooking, pull the turkey from the refrigerator. Soak a few wood chips before building your fire. Rub the melted butter all over the turkey. Sprinkle with salt and pepper. Set the coals for indirect cooking. I usually do a set up on two sides of the grill. Place a drip pan below where you are going to set the bird. Put on the upper grill and clean it with a wire brush before oiling the grate. Set your turkey down and let cook for 1 hour. Go in and remove the drip pan if you’re making gravy. Take the turkey’s temperature – done is when the internal temperature reaches 165 degrees F. Baste with butter. Continue to cook until it reaches that safe temperature, checking every 15 minutes and basting with butter. Bone in will take longer to cook than boneless. Remove from grill when done. Let rest for 15-20 minutes before slicing and serving. I have to say I was a little intimidated when Victoria gave me this recipe. I once saw strudel being made and they had stretched this piece of dough until it was as big as a dining room table and thin enough to read the newspaper through. However, her mom’s method had the dough being divided into four pieces, so it didn’t have to be stretched so much. I found stretching it 18 by 12 inches was sufficient to make thin layers. And, because, I was dividing it into fourths, I decided to add a classic apple filling to half of them (leaving the others with her mom’s classic cinnamon raisin nut version). Most recipes I read recommended using a high gluten bread flour, so I did that, as the original recipe only specified flour. I also soaked the raisins to soften them for about 5 minutes in hot water before draining them and patting them dry. As I’m allergic to walnuts, I used pecans instead but left walnuts in the recipe. I used a food processor to make the dough, although you can mix everything together in a bowl and knead until a smooth dough forms. I also divided my dough in half before resting – I did half the dough after the four hour rest and the rest for brunch the next morning. Place butter, water and vinegar in a bowl of a food processor and pulse to combine. Add the flour and and process until the dough is smooth. Remove to a well buttered bowl and cover. Let rest in the fridge for 4 hours or overnight. 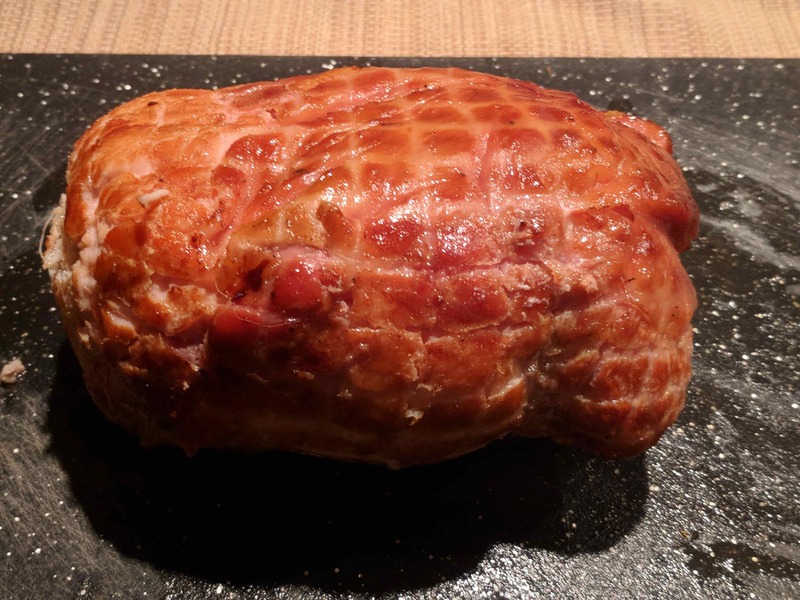 If you let it rest overnight, let it warm on the counter for an hour or two before attempting to roll out. 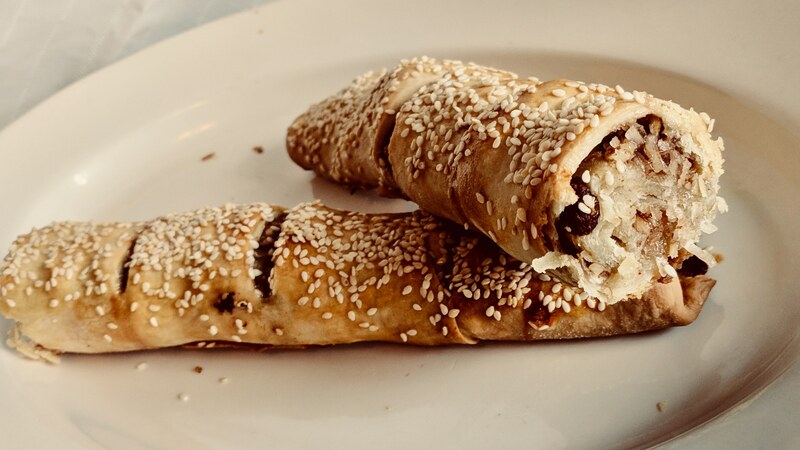 For Cinnamon Raisin Nut Filling: Combine all the filling ingredients together. For Apple Filling: Toss the prepared apples with the lemon juice. Stir together with the rest of the ingredients. If it is super liquidy, add 1 tablespoon corn starch and stir well. Divide each filling into two portions and set aside while you prepare the dough. Divide dough into 4 parts. Take off any rings, bracelets and watches and have your arms bare to the elbow. Pat the dough into the shape of a rectangle. Set the piece of dough on the center of your work surface and roll out in each direction with a rolling pin. Let the dough rest for a few minutes. Lifting up a section, gently stretch the dough out on the sides, using the back of your hands and working your way around the entire rectangle. It should be semi-translucent in some places, but be careful not to tear it. Don’t worry too much if you do, though, as the many layers will hide the rips. Drip butter onto the dough – it is too delicate to brush with butter. Place dollops of one portion of filling on the buttered dough and gently spread out, being careful not to tear the dough. Brush exposed ends with melted butter, fold in sides of dough, then gently roll dough into a cylinder. Seam should be on the bottom. 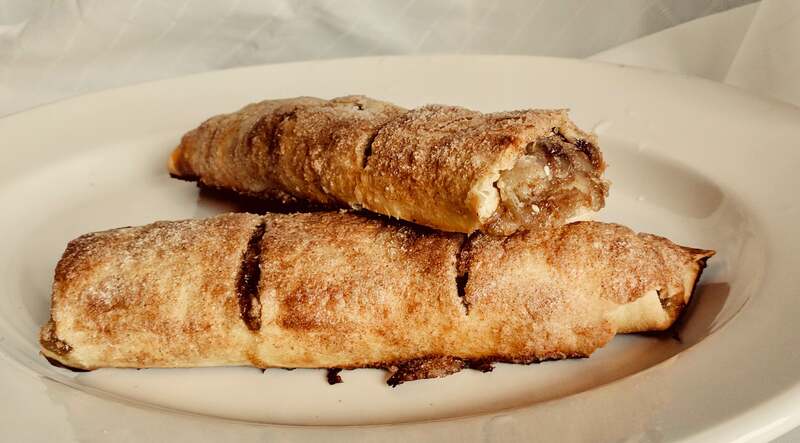 Score the top of the strudel in portion-sized sections before you put it in the oven. The knife marks will make a clean slice easier after the strudel is baked. Brush an egg mixed with 1 tablespoon of water on top of the cylinders. Sprinkle with sesame seeds on the cinnamon raisin nut filled ones and with cinnamon sugar for the apple filling. Bake on a greased baking pan for 30 minutes, rotating once midway through baking. Begin rolling out the dough for the next strudel while one is cooking. Follow above directions for filling and rolling and baking. Slice when hot. Serve with ice cream or with coffee/tea and it is even better served cold the next day. I’m doing National Novel Writing Month (NaNoWriMo) again this year and thought I could use some brain boosting to help get me started on writing a 50,000 word novel in 30 days. Turmeric, with its curcumin content, has a number of health benefits (especially when paired with black pepper to assist your body in absorbing it), including helping fuel your brain. It also tastes good and adds a pretty golden color to food, so what’s not to like? Combine buttermilk and seasonings in a large container. Add chicken. Place in the refrigerator and chill for at least 4 hours and as long as overnight. Remove chicken and discard brine. Drain chicken and pat dry. Place in a single layer in a large pan. Place in the refrigerator until ready to build your fire. Combine all ingredients and mix with your fingers to break up any lumps. I needed to double the recipe for 10 lbs of chicken. Sprinkle over both sides of the chicken at least 1 hour before grilling. 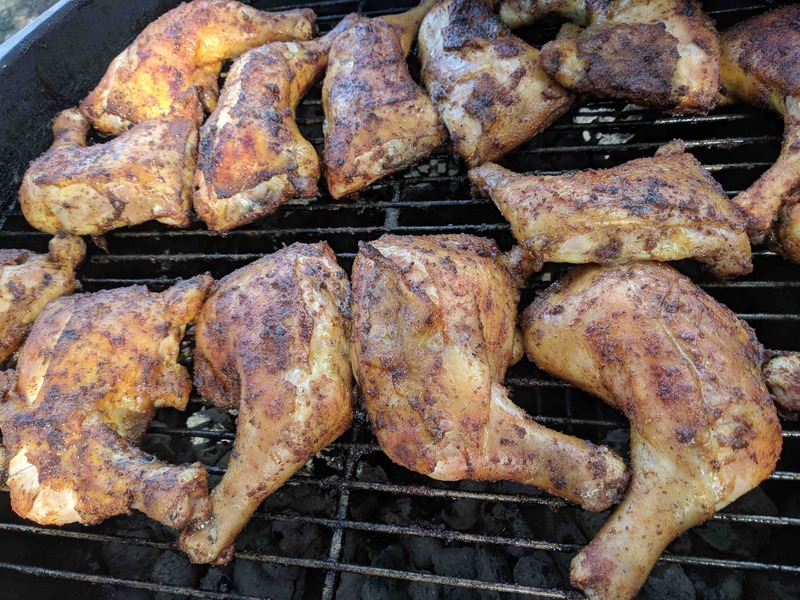 Grill over indirect heat until the internal temperature registers 165 F. I usually put it skin side down for the first 20 minutes and then flip it over for the next 40 or so minutes, placing the drumstick closest to the heat.